← Bolivian collectives travel to Peru to denounce evo’s desire to remain in power! Bolivia’s Evo Morales and Venezuela’s Nicolás Maduro are both classic Latin American strongmen. But that’s where the similarities end. Latin America’s elected leaders gather in Peru later this week to discuss democracy in their region, one topic will likely be high on the agenda: Venezuela, which was barred from attending this year’s Summit of the Americas because it has an authoritarian government. Several countries have criticized Venezuela’s exclusion, chief among them Bolivia. Bolivian president Evo Morales, a close ally of its late populist president Hugo Chávez, has long defended the Venezuelan regime against its foreign critics. Venezuela and Bolivia are so politically tied, in fact, that it has some democracy observers concerned. Is Morales taking Bolivia down the same dangerous path that led nearby Venezuela into dictatorship? In 2016, Bolivian voters rejected a referendum on whether incumbent presidents – then limited to two consecutive five-year administrations – should be able to run for reelection. Morales, then in his third term because of a technicality related to Bolivia’s new 2009 Constitution, promised to respect the “will of the people.” No fourth term, he said. That was then. Morales has since decided to run for reelection next year after a December 2017 Supreme Court ruling abolishing term limits for Bolivian elected officials. As social scientists who specialize in Latin America, we understand the temptation now to compare Bolivia with Venezuela. Both countries have embraced charismatic political leaders who run their nations by force of personality. President Chávez, who ruled Venezuela from 1999 to 2013, consolidated his power by abolishing term limits, attacking judicial independence and curtailing press freedoms. He died shortly into his third term. Chávez’s hand-picked successor, Nicolás Maduro, has expanded these tactics, jailing dissidents and neutering Parliament. Despite overseeing the country’s descent into economic chaos, Maduro is widely expected to win his bid for a second term in 2018. Most opposition candidates are either imprisoned or banned from politics. Bolivia and Venezuela are also outspoken critics of the United States and founding members of the so-called Bolivarian Alliance, a leftist grouping of Latin American and Caribbean nations started by Chávez and Fidel Castro in 2004. After the White House passed sanctions against Venezuela, in November 2017, Morales bristled. “Latin America is no longer a Yankee colony,” he exclaimed. There are, however, pronounced political and social differences between Bolivia and Venezuela that should prevent Morales from following in Chávez’s footsteps. Chávez used Venezuela’s oil riches to shower benefits on Bolivia and other neighbors, sending subsidized oil to countries across Central America and the Caribbean. Today, Maduro needles the United States by having Citgo – a U.S.-based subsidiary of the state-owned Petróeos de Venezuela – provide cheap gasoline to Americans in need. The company recently offered US$5 million in oil aid to victims of Hurricane Harvey in Texas. Bolivia’s booming economy has certainly empowered Morales at home, allowing him to fund a range of popular social programs. These include cash payments to poor families, a minimum wage hike, pensions for people with disabilities and major infrastructure projects. Such successes have largely muted Morales’s domestic critics. But he is also constrained domestically, kept in check by the same social movements that catapulted him to power. Morales’s political career began when he was elected to head Bolivia’s largest federation of coca growers in 1988, a post he still holds. 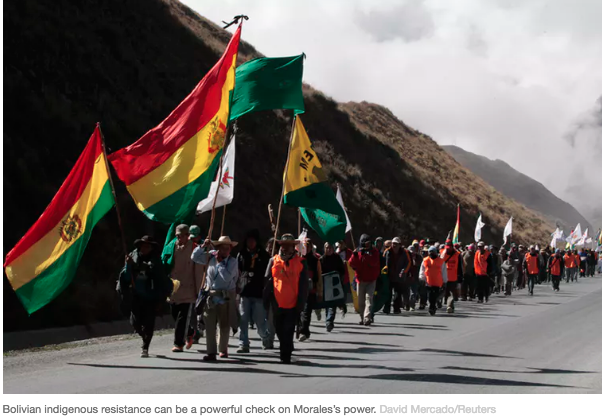 Under Morales’s leadership, the coca farmers – who, like most Bolivians, are ethnically indigenous – militantly resisted such U.S.-backed state counternarcotics policies as forced eradication, fumigation and crop substitution schemes. Morales gained national prominence in the early 2000s when he led numerous mass marches and strikes to protest government efforts to privatize utilities and tax public employees’ salaries. Throughout this period, Morales claimed to be “leading by obeying” his constituency. 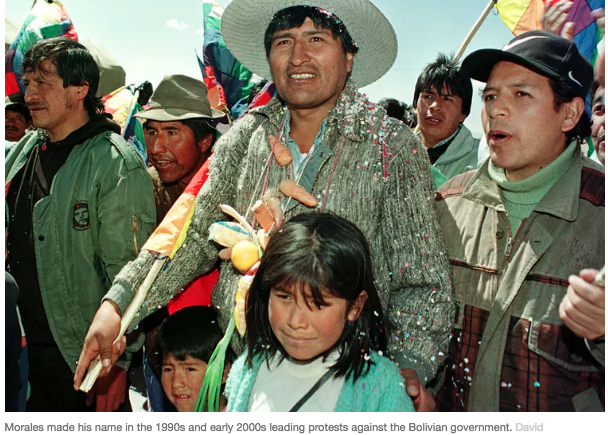 He relied on popular referendums to inform his policies and respected the collective decision-making processes typical of Bolivia’s indigenous communities. As such, he said, his actions directly represented the people’s will. Morales has continued to make this claim as president. He describes his Movimiento al Socialismo, or MAS, not as a political party – though technically it is – but as an expression of Bolivian social movements. His legitimacy thus depends on faithfully advancing the priorities of the MAS’s grassroots and indigenous base. Whenever his supporters believe that Morales is imposing his own political agenda, they’re quick to oppose him. When he recently decided to revive the road project, indigenous residents of the park again mobilized in resistance. Similarly, Morales’s decision to ignore the results of the 2016 referendum on term limits spurred swift retaliation. The president’s approval ratings– which have hovered around 75 percent – dropped as much as 50 percent, according to some polls. This entry was posted in Bolivia, Business, Drug war - narcotraffick, Economics, Politics, Social Unrest, TIPNIS and tagged bad politics, corruption in public office, demagogue, democracy in peril, government failures, Ochlocracy. Bookmark the permalink. Dear Sir although I am a beginner on this forum I do keep an eye on the future of Bolivia.I have just passed an idle thought on to the Bolivian Express newspaper and thought you may wish to peruse it too: Studying the route of the trans-oceanic railway at some stage cargo from Chile will need to pass through Bolivian territory.Surely that gives Bolivia a strong hand,ie no sea for Bolivia,no rail for Chile.Just a thought! Cutting a route through the Andes comes in expensive. Our main problem is the one that made evo our president: blockades on our main transportation routes, he used that to force himself to take the government. Of course, he now says is not good to blockade, when his acolytes want to renegotiate deals with him, or the opposition tries to blockade to get themselves heard on a particular issue, more pertaining budget allocation. Thus, anarchy rules now and it will be very hard to make roads and railroads safe to use at all times. Enforcing the law and ban in whatever means possible these blockades remains to be seen. However, those who want that railroad to be built, just want to do it, to get the contract, they could care less about its real feasibility and free access. As evo tries to remain in power at all cost, he used our claim at The Hague against Chile, he could certainly use this railroad as a means to his interests alone! I agree with your assessment,although one point of your argument talks of cost.Using rail will allow big,(and I mean big)container ships to use custom built docking.30,000teu per vessel and plus.The savings in time and costs would be substantial.Fuel and delivery times,(the panama canal will not be big enough)Some of these ships to Europe are 100,000 tons. I think it would be more,much more than china-brazil traffic passing through the rail system.Look at the demographics:The bottleneck from Europe to china is the panama canal,(two rail hubs could speed up the through traffic by some say, ten days) so there is the cost of panama transit,which at the moment is the only route by way of south America,therefore artificially high.So I rest my case in hope for Bolivia.clutching at straws possibly but lets cross our fingers! Thank you for giving me the platform for my theory. I certainly understand your point of view and can see the markets you are considering, which are far beyond what Bolivia needs. Which also makes my case: there are a number of routes other than through Bolivia, which could better serve those needs. As a Bolivian I do not want to spend more money just to please current autocrat. Regarding the world, I do not want Bolivia to be blamed for blockades until we do something real about it. Thank you SO much for your comments and insights!